Keep your cash flow in check by deferring payment until June 28, 2019. All you need to do is order Qualifying Products by February 28, 2019. It’s just one way to manage your expenses a little more easily throughout the season. SummerPay is even offered on products that are a part of the Barricade® Brand Bonus, Multipaks and Pallet Solution purchased during the Early Order Period. 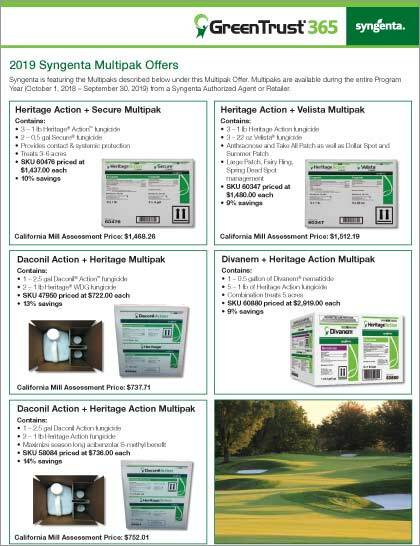 ©2018 Syngenta. Important: Always read and follow label instructions. Some products may not be registered for sale or use in all states or counties and/or may have state specific use requirements. Please check with your local extension service to ensure registration and proper use. Barricade®, GreenTrust®, SummerPay™ and the Syngenta logo are trademarks of a Syngenta Group Company.